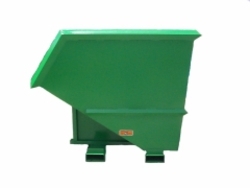 Here are some specialty application self dumping hopper ideas from Roura, let us know about your special needs! 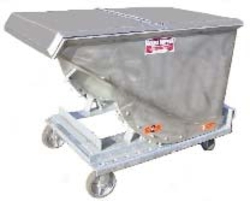 Ultra HD hopper can be made using up to a 1/2" thick plate on the hopper body. By using tubular steel reinforcement the bases are designed for nasty applications. In the glass industry hood is used to deflect objects. 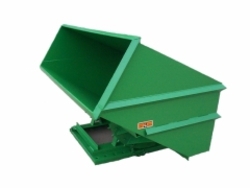 Used for highly corrosive materials application or the food industry for waste. 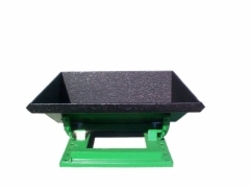 body with a galvanized mild steel base to keep cost reasonable. 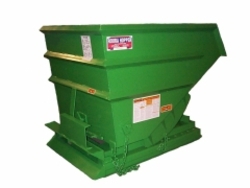 A controlled gradual dump by using a Gator rotator box with a self-dumping hopper style body.